Retail and institutional investors have been stunned at recent stock market volatility. The general thinking is that everything is related to the global financial crisis, starting, for the most part, in August 2007, when the Volatility Index, or VIX, started to climb. We believe, however, that there are more fundamental reasons behind the explosion in trading volume and the speed at which stock prices and indexes are changing. It has to do with the way electronic trading, the new for-profit exchanges and ECNs, the NYSE Hybrid and the SEC’s Regulation NMS have all come together in unexpected ways, starting, coincidently, in late summer of 2007. This has resulted in the proliferation of a new generation of very profitable, high-speed, computerized trading firms and methods that are causing retail and institutional investors to chase artificial prices. These high frequency traders make tiny amounts of money per share, on a huge volume of small trades, taking advantage of the fact that all listed stocks are now available for electronic trading, thanks to Reg NMS and the NYSE Hybrid. Now that it has become so profitable, according to more such firms are starting up, funded by hedge funds and private equity (only $10 million to $100 million is needed), and the exchanges and ECNs are courting their business. 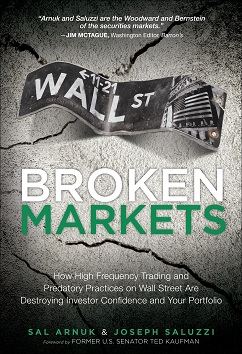 This paper will explain how these traders – namely liquidity rebate traders, predatory algorithmic traders, automated market makers, and program traders – are exploiting the new market dynamics and negatively affecting real investors. We conclude with suggestions on what can be done to mitigate or reduce these effects. To illustrate most situations, we will use a hypothetical institutional order to buy 10,000 shares of a stock at $20.00 that has been input into algorithmic trading systems, which most buy side traders use. Algorithmic or “algo” trading systems chop up big orders into hundreds of smaller ones that are fed into the market as the orders are filled or in line with the volume of the stock in question. Typically, such orders are easy to spot as they commonly show that the trader has 100 or 500 shares to sell or buy. great piece….keep up the good work…keep em honest !